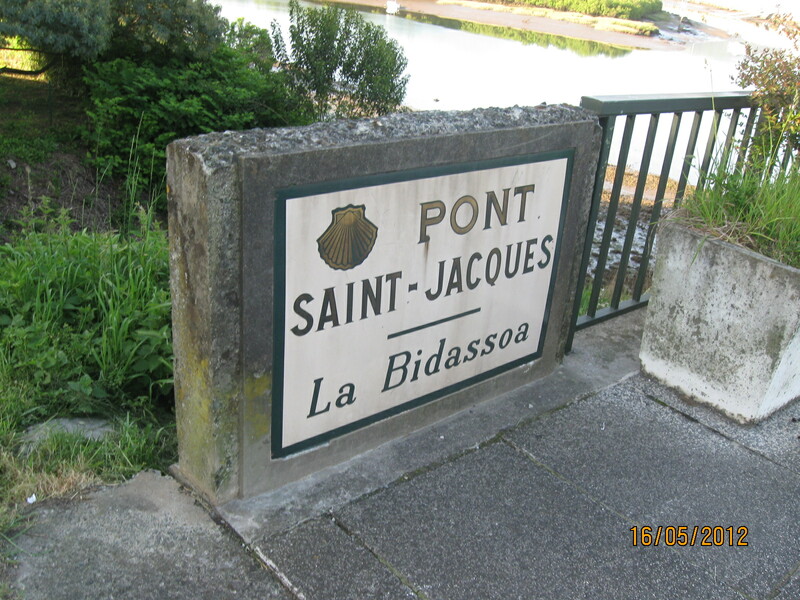 On 15th May 2012, myself, my brother-in-law, Cormac Jevens and his friend, John Nolan arrived to the French border town of Hendaye to walk some or all of the Camino del Norte. 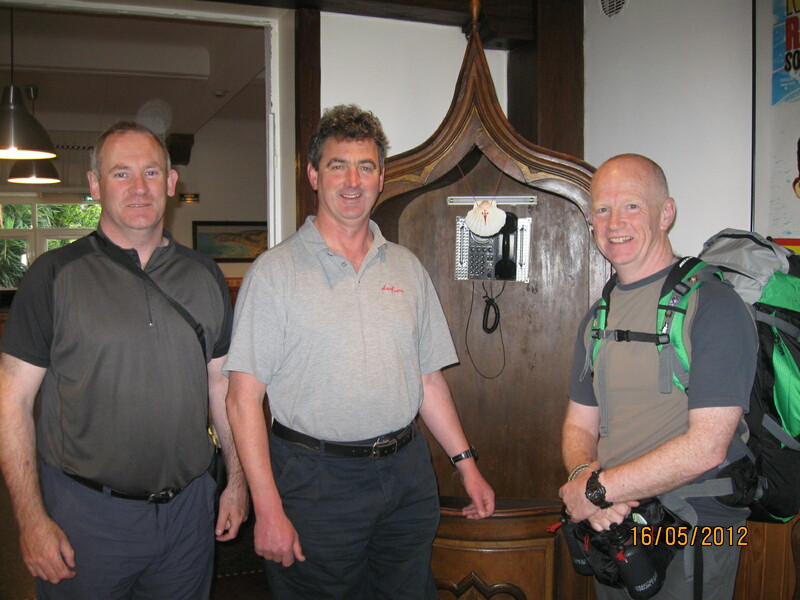 Cormac and I were only going as far as Bilbao, while John was hoping to go all the way (c.830kms) to Santiago de Compostella. 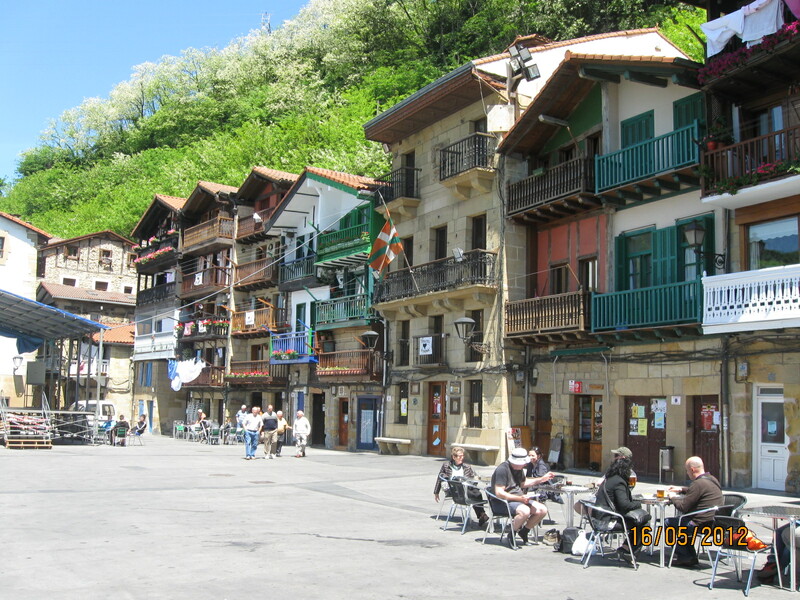 The Basque country is in the foothills of the Pyrinees and is, to say the least, rather hilly. 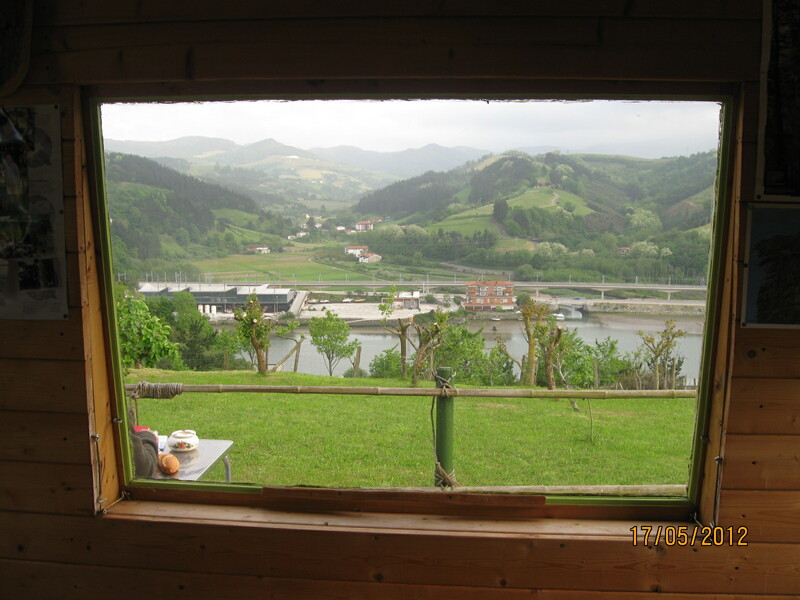 Our chosen coastal route via Irun/San Sebastian/Orio/Deba/Markina/Gernika/Bilbao of c.160kms was very much in this hilly mode. But what a beautiful countryside it was. Despite having 5 wet days out of our initial 7 in rain, the beauty still shone through. 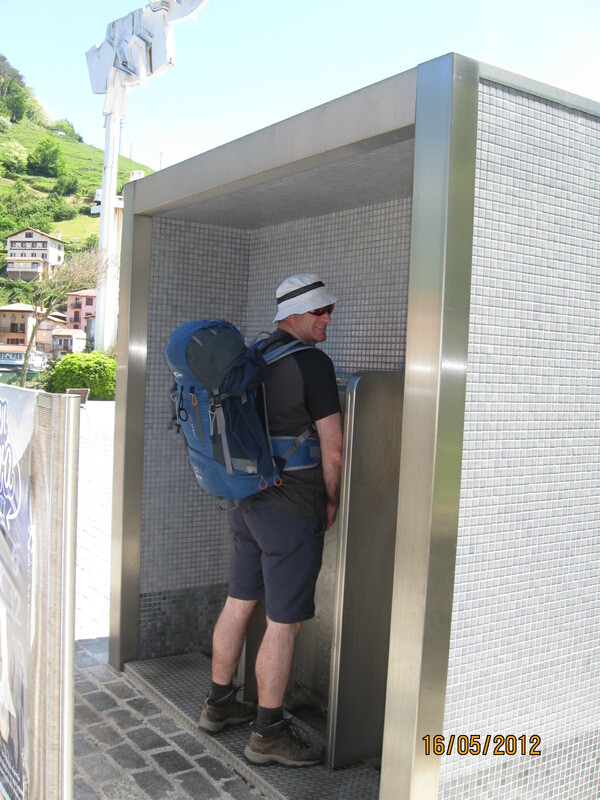 Cormac answers a call of nature. Believe it or not, this outdoor facility is unisex! 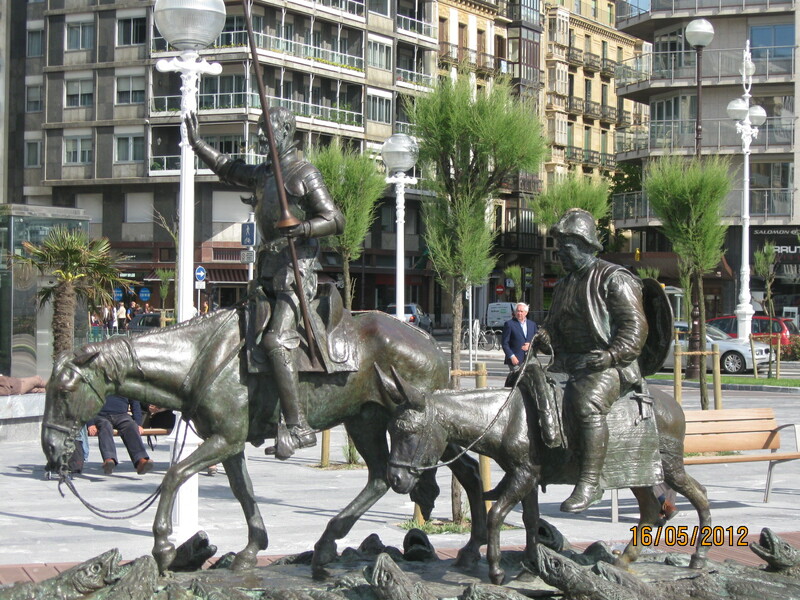 Don Quixote and his Sancho Pansa in San Sebastian – a really beautiful city despite its industrial heritage. 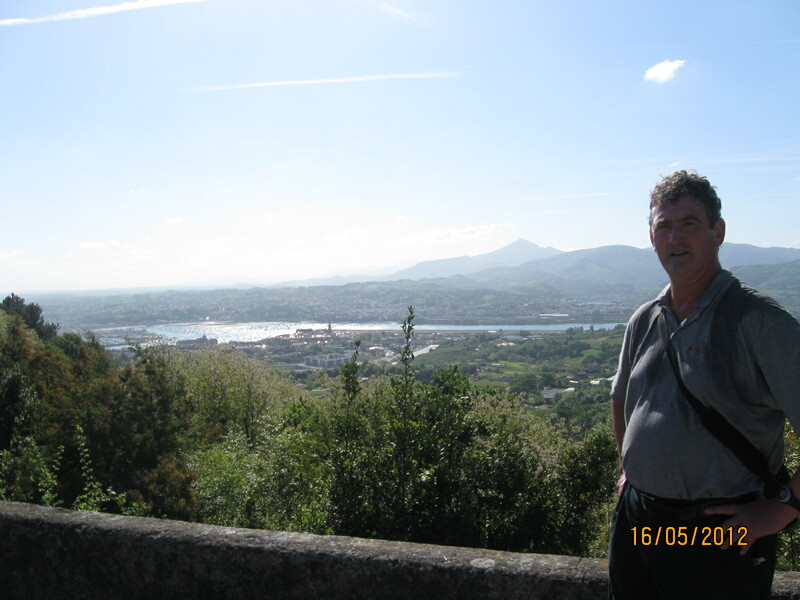 When we arrived in San Sebastian, we were met by another peregrino (pilgrim), Alan Cronin, from Cork a mutual friend through my sister Mary, Cormac’s wife. Our days trek was of the order of 29kms in very warm conditions and it was nice to have someone else organising our accommodation, a Youth Hostel on the western fringe of the city. After a few hours sampling the cities food at 31 August and a beer, we retired for an early start on Thursday. 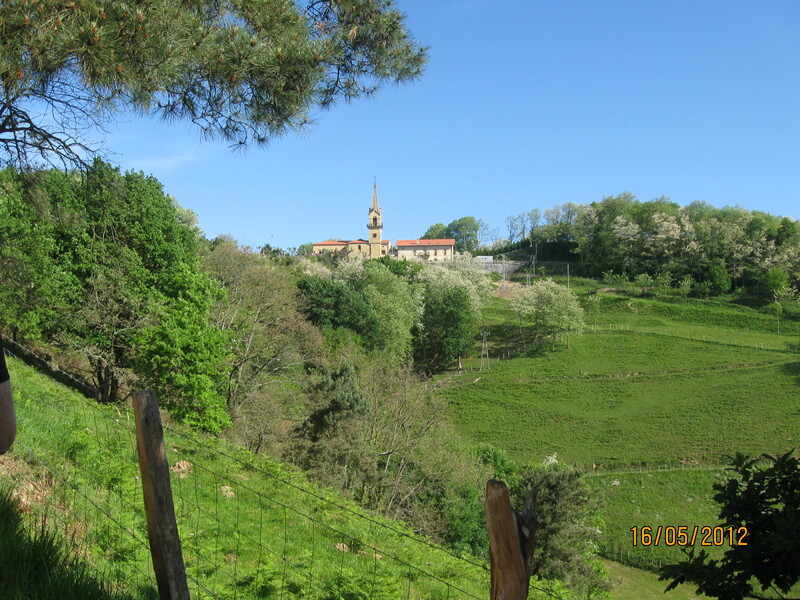 Day 1 was very enjoyable, taking in the long ridge between Irun and Pasaije, a wonderful little fishing/ferry village and the final climb above the coast to bring us to San Sebastian. One guilty image remains in my brain. As we descended towards Pasaije San Juan, we came across a ewe in distress on the forest path. Something or someone had damaged her throat, with blood visible around a recent wound. She was obviously close to dying, but we couldn’t do anything for her. Afterwards, a few days later, the thought occurred to me that we could possibly have smothered her to put the poor creature out of her misery. Too late. I hope she died soon after we left her. This entry was posted in International, Walking by Charlie Kavanagh. Bookmark the permalink.